Sudden Oak Death causing mortality on Tanoak in California. Photo by Keith Parker, courtesy of Professor David Rizzo, University of California, Davis. 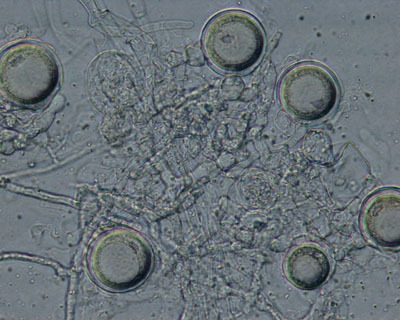 Phytophthora species have microscopic spores and detailed morphological and molecular studies are needed to accurately identify them. 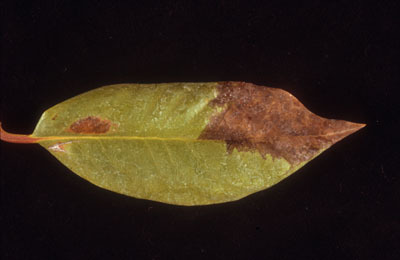 Foliar symptoms caused by Phytophthora ramorum on Rhododendron leaf from California. Photo courtesy of Professor David Rizzo, University of California, Davis. Sudden Oak Death, a serious disease of oaks, caused by Phytophthora ramorum has NOT been found in Minnesota. However, other Phytophthora species are causing very serious losses on woody ornamentals in Minnesota and our research program is identifying these species using molecular techniques and finding appropriate methods for control. The highly valued and ecologically important oak population in urban landscapes and forests of Minnesota is at great risk from the introduction of Sudden Oak Death and we continue our efforts to look for this disease on woody plants brought into the state and to do everything possible to prevent it from getting established. Many people have heard about Sudden Oak Death and would like more information. Pioneering efforts on the etiology of this disease have been carried out by Professor David Rizzo at the University of California at Davis, a past student who received his Ph D here in forest pathology. To find out how to recognize this disease and for general information see the Diagnostic Guide for Sudden Oak Death. 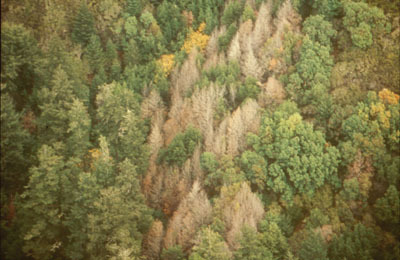 Although Phytophthora ramorum causes mortality on oak trees in California it also causes branch and stem cankers, shoot and tip dieback and foliar lesions on other plants like Rhododendron, Viburnum and Camellia. Plants that have just foliar symptoms and are shipped to nurseries in other areas can spread the disease to new locations. Each year, woody ornamental nurseries and home owners throughout the upper midwestern United States lose countless numbers of shrubs and trees to unknown diseases. One group causing serious losses is the fungus-like organism called Phytophthora (the name is derived from the Greek meaning plant-destroyer). Little research has been done on this pathogen of woody plants in Minnesota. Our investigations to monitor for Sudden Oak Death have provided important new information on the Phytophthora species that are problematic in Minnesota nurseries. ©2015 Robert A. Blanchette. All Rights Reserved.